The latest edition of French satirical magazine Charlie Hebdo was greeted in the UK with huge lines, as swathes of people waited to get their hands on one of the limited 2,000 copies on sale in London. It is the first publication of the magazine since its offices were stormed by Islamist militants who shot dead eight of its journalists and left another nine dead over the course of a three-day siege. The Kouachi brothers, who staged the initial attack on the offices, were shot dead by police on January 9 at a small printworks north of Paris. This issue of the magazine has been heralded as a symbolic gesture against terrorism, and in support of free speech. 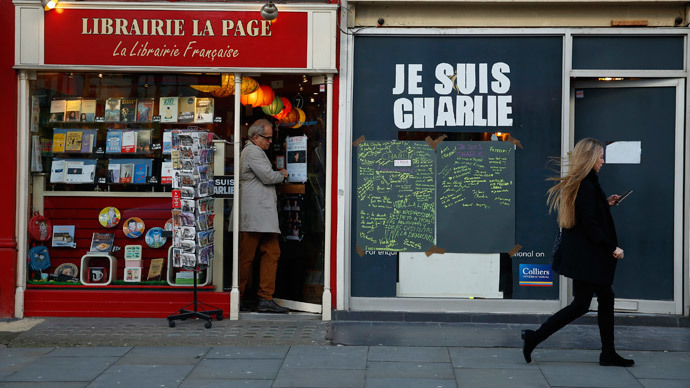 Charlie Hebdo’s offices were previously firebombed in 2011, after the magazine published cartoons of the Prophet Mohammed. Crowds gathered early Friday morning at the five stores in central London selling the special issue. Within an hour there were reports that The French Bookshop in South Kensington was completely sold out, following the trend in France, where the edition was released Wednesday and sold out within minutes, driving the publishers to increase the print run to 5 million. One member of the public lining up to buy the magazine told the Independent he was buying the issue in the name of free speech. Another individual said they wanted to be a part of the movement #JeSuisCharlie which followed the attacks. “I came out today because there are a lot of occasions where we can stand up for free speech in Western countries. I am French but I couldn't be at the demonstrations on the weekend and I wanted to be part of it,” he said. The media were also on hand to document the moment the magazine went on sale. Outlets have been wary, however, of showing the cartoons in full, and some photographers reportedly asked members of the public to fold their magazines in half when posing for pictures, so that the image of the Prophet was hidden.